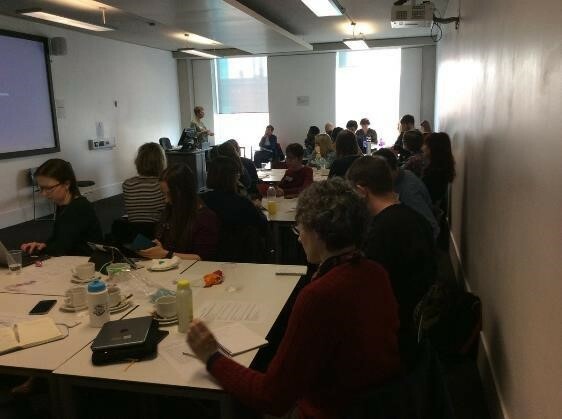 Catherine McManamon, Liaison Librarian at the University of Liverpool, has kindly provided a report on a recent Library TeachMeet event, which was hosted by Manchester Metropolitan University and sponsored by the CILIP Information Literacy Group. It was a pleasure to welcome around 30 enthusiastic librarians and information professionals to our Library TeachMeet on Research Support. A lot is happening in the world of research and it was great to get together to thrash out the challenges facing both new and experienced researchers. There was a sense that this event was much needed and attendees had both specific and general questions covering a range of topics such as, the REF, non-print research and academic skills to name a few. There was a wealth of experience in the room and it was useful to see how institutions from all over the country support their researchers. Following refreshments and a bit of networking we got the ball rolling with an online quiz on research support. Each team approached the quiz with great gusto and raced against each other to complete the quiz first. I think the promise of chocolate for the winning team spurred everyone on! It was then down to business with six 10 minute presentations (with the essential time for tea, cake and networking in the middle). The presentations covered a range of topics and were very engaging and relevant. First to speak was Monna Rizvi of Middlesex University who presented a very inspiring talk entitled Researchers: where are you at? Identifying and improving the research student support at Middlesex University. Monna talked about organisational change and the opportunity it gave to review and improve research support. The enhanced training programme for its researchers was particularly impressive. It struck me that much thought has gone into tailoring the programme to the actual needs of the researchers. Monna also talked about trying out new ideas to improve engagement and I particularly liked the idea of the human book where researchers can book a short one to one session with a librarian. Next up was Sally Dalton of the University of Leeds who presented Researcher Skills Development: Branching out from traditional information literacy, which started with a quick online poll. The question was ‘What face to face/online teaching do you deliver for PhDs/Researchers?’ It was interesting to see the differences between the institutions. It was a great start to the presentation and got us thinking about what we currently do and should be doing. The University of Leeds has a very extensive and broad research support programme and the message that came across is that this has developed better relationships with researchers and other departments. Sally is keen to investigate the provision of academic skills and an interesting discussion ensued. An impressive presentation by Sally. Rosemary Russell of Imperial College London gave an interesting presentation on Supporting Open Access for Business Researchers at Imperial College. In particular, she pointed out that the differing backgrounds of business researchers presented a challenge. Student enquiries and meetings with the Business School Research Manager and the PhD Programme Manager confirmed that PhD students had very little knowledge of Open Access. Rosemary talked about increasing researcher engagement by highlighting the advantages of Open Access such as increased citations, influence on policy papers and career advantage. After the tea break, Helen Blanchett from Jisc talked about ORCID and the vast range of Jisc resources that are available to help promote ORCID to researchers. During the afternoon it was clear that many of the attendees wanted to know more about ORCID and Helen’s presentation was very timely. Helen demonstrated the ‘ORCID Communications Toolkit’ that covers all aspects of delivering and engaging researchers with ORCID. I particularly liked the ‘ten next steps for new members’ on the ORCID website, which guides institutions through the whole process from membership to launch. Helen’s presentation was very informative and demystified all things ORCID! Our next speaker was Sarah Beighton of Staffordshire University who presented How do we support non-traditional research? Addressing the challenges in supporting practice based research through REF 2021. There is no clear guidance on how to add non-print research to repositories and how the metadata can describe and document it. Sarah’s presentation was very informative and provided much needed solutions on how to achieve this. I particularly liked her idea of having good examples to show staff. The presentation generated much discussion, especially as this is a relatively new area, and I personally felt more confident in addressing this issue. Finally, Lynne Crook and Steve Carlton of the University of Salford presented Helping Them Find Their Voice: training student researchers to effectively reach their audience. This was a refreshing presentation outlining innovative ways of promoting research. It was interesting to hear the breadth of training sessions delivered by the Library including ‘writing for publication’ and ‘designing and presenting a poster.’ Lynne and Steve also discussed ‘Improv’ exercises that engaged the researchers making sessions more active and fun. After the presentations, there was a short time for groups to discuss what, if anything, they could take away from the event whether it be a good idea from the presentations or networking. I felt it was important that attendees could network and find a fellow attendee(s) to share good practice with and support each other through the challenges of research support. On reflection I felt the event went well and this was due to the attendees who were extremely enthusiastic and engaging from start to finish! The presentations were excellent and informative, providing a good spread of topics on many aspects of information literacy. There was a lot to discuss and I felt the event could have easily filled a day rather than an afternoon. Plenty of discussion was generated during the event, some of which is on Twitter at #mmulibtm. I would like to thank the CILIP Information Literacy Group for kindly sponsoring the TeachMeet, and our attendees who had travelled from the length and breadth of England. I would also like to thank the presenters who delivered inspiring and engaging presentations.